When the wealthy commit crimes, the world goes on turning like normal. When the less wealthy commit crimes, the world goes bananas. 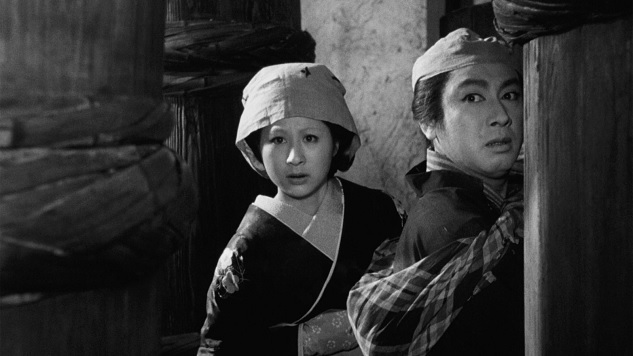 In Kenji Mizoguchi’s A Story from Chikamatsu, the crimes of the former outweigh the crimes of the latter, but that hardly matters to anyone other than karma. Kyoto-based scroll-maker Ishun (Eitaro Shindo) steals into his maid’s bedroom to hit on her despite her repeated refusals to be his plaything, and he gets away with it on the back of social mores that let him get away with it. Meanwhile, his apprentice Mohei (Kazuo Hasegawa) embezzles from Ishun, gets caught, gets simultaneously and falsely accused of banging the very same maid, and winds up locked in attic. Crime is crime, but at least Mohei steals from a rich dude for a good reason: Ishun’s long-suffering wife, Osan (Kyoko Kagawa), asks him to help her secure a loan for her brother after being refused by Ishun. So it’s really Ishun’s own damn fault. He’s a creep, too. Mohei’s crime is victimless, but he pays for it, and so does Osan, in 1700s ignominy. In one of the many valuable archival cast and crew interviews found in Criterion’s new Blu-ray release of Billy Wilder’s iconic comedy Some Like It Hot, Jack Lemmon, while doing a terrific Wilder impression, recalls the phone call he received pitching him on one of the main roles in the film. Lemmon thought the premise—of two prohibition-era jazz musicians (Lemmon and Tony Curtis) having to disguise themselves as women and infiltrate an all-female band in order to get away from the mob—to be as hacky as it sounds. But, he points out, it was Wilder, so he went with it, all the while wondering if this great writer and director has finally cracked. Like almost everything David Byrne conjures—most recently, his tour behind solo album American Utopia and his 2012 art piece/book How Music Works—True Stories, the man’s only narrative feature, both revels in and calmly nods to the jubilation of eccentricity. His aforementioned tour is as triumphantly, meticulously assembled as Stop Making Sense, and his book, which he explains in its intro is meant to be a series of chapters able to be read in whatever order one chooses, simultaneously lives up to its title with academic rigor, and fantasizes, awestruck and child-like—as only Byrne can pull off—about the magic of sound. So it is with his True Stories, a celebration of a fictional Texas town, upon the eve of its big sesquicentennial, serving as a bigger celebration of the “specialness” of each and every one of us. Only Byrne could hold aloft such a contradiction, claiming that every single person is equally eccentric—that every single person should be celebrated, together, for being so different. He’s nothing if not magnanimous. A stranger (Byrne) dressed in colorful cowboy formal gear coasts into Virgil, Texas aboard his convertible, explaining both the history of Texas and the ecosystem of its small-town denizens, who all, in some form or another, owe their livelihood to Varicorp, Virgil’s primary employer and behemoth computer company. Accompanied by esoteric title cards and teensy vignettes, the stranger’s welcomed by Virgil folks as he tours around, meeting kind-hearted lothario Louis Fyne (John Goodman, source of inimitable warmth and light in an early role), or marveling at a woman (Swoozie Kurtz) who’s so rich he can spend her life in bed, fed the world via TV and magazines, or sitting wide-eyed at dinner with the owner of Varicorp (Spalding Grey) as he communicates with his wife (Annie McEnroe) through their children and describes, as their meal glows beatifically, what metaphysical wonders his company hath wrought. Throughout, Byrne acts extra-terrestrial, super-nice but odd, each line read pushed from his mouth as if he’s discovering words for the first time, endlessly curious and heedlessly non-judgmental. He is, in other words, Virgil’s Virgil, leading the viewer through an alien world that, turns out, is only alien to the tour guide. The rest of us, we recognize the consumerism and industrialism and romance and religiosity on display—it is, all of it, explicitly American, a sensation Byrne seems to both criticize and embrace as uniquely geared towards essentialism. True Stories contains both the promise and failure of the American way, people seemingly happy only if they’re given the wide open space—of Texas at that—to be themselves.